Kittens are born with the instinct to dig around before and after they eliminate. 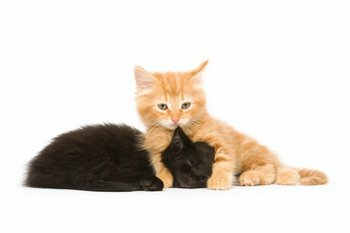 This instinct allows you to easily litter box train your cat or kitten. Cat box training should begin once you bring your new kitten home. Before you bring home your new cat or kitten, you need to decide where you are going to put the litter box. It is best to put it in a quiet area where the kitten won’t be disturbed. Areas with an easy to clean floor are ideal as this allows you to be able to easily clean up any litter that may be tracked outside of the box. If you have other cats in the house, you will want to get a separate litter box for your new cat. There should be one litter box for each cat in the house, plus one additional. Some cats can be very finicky when it comes to their litter box. You also want to have a litter box on each level of the house. This will help ensure your kitten can make it to the litter box in time. Once you are home you will want to begin kitten training. One of the first things you should do is show your kitten where the litter box is located. Place the kitten inside the box so that they will know that it is the litter box. Take the kitten to the litter box throughout the day until they go to the box on their own. Kitten training requires patience and repetition until they understand.